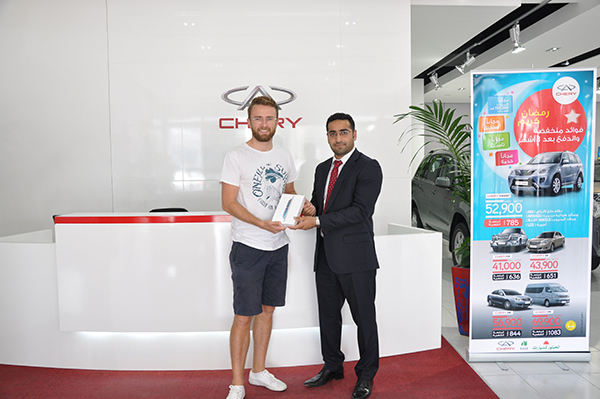 Al Habtoor Motors announced the 3 lucky winners of the Mitsubishi and Chery Online iPad Mini draw on 4th June 2014. The winners were congratulated in a small ceremony held in the respective Mitsubishi and Chery showrooms in Deira. The winners of the Mitsubishi iPad Online Competition- Ms. Marynes Esguerra, Mr. Fedaa Nassef and Mr. Ahmed Gouhan received the Ipad mini from Mr. Nassib Nassar, Senior Marketing Manager for Al Habtoor Motors whereas the winners of the Chery iPad Online Competition – Mr. James Samuel Coward, Mr. Ashraf Bastawisy and Mr. Bibsi Hamza received the Ipad mini from Mr. Muhammed Shahnawaz, Marketing Specialist for Al Habtoor Motors. “We at Al Habtoor Motors are very overwhelmed with the response received for the competition. Al Habtoor Motors has conducted many such draws in the past. It is pivotal to our organization that we engage with our customers and our senior management thought of this to be a great opportunity to stir some excitement among our existing and potential consumers.” said Mr. Nassar.